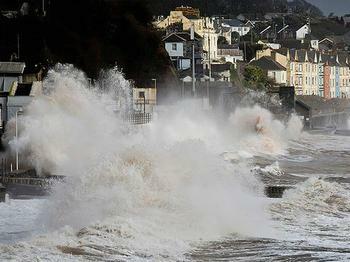 LONDON, UK, February 7, 2014 (ENS) – Met Office forecasters warn that strong winds and big waves will bring risk of flooding and damaging winds along Britain’s southern and southwestern coasts into the weekend, intensifying storm conditions that have persisted all week. Globally, coastal regions face “massive increases in damages from storm surge flooding during the 21st century,” new research predicts. Over the next three days, more rain and very strong winds are in the forecast as Atlantic storm Ruth batters Britain this weekend bringing 80 mph winds and 35 foot waves. Forecasters warn of an “absolute monster” and the Met Office says the whole country will be “engulfed” by rain as the worst of a “conveyor belt of storms” is on the way. 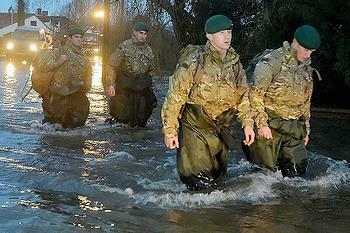 Royal Marines are helping to evacuate scores of people from the village of Moorland and other areas of the Somerset Levels as heavy rain overwhelms local defenses. Environment Agency crews are running the biggest pumping operation ever seen on the Somerset Levels, with around 2.9 million tonnes of water being pumped out every day. 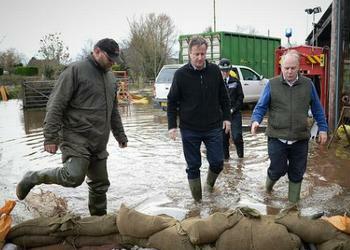 Prime Minister David Cameron toured Somerset today to see the impact of the floods and meet local residents, farmers and emergency teams. 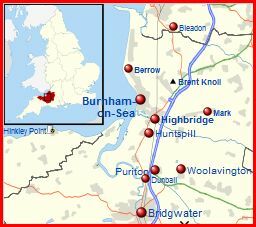 The Prime Minister announced £100 million for flood defenses and says there will be “no restrictions on help” for those affected. December and January combined have been the wettest combined for more than 100 years in the UK, with rain falling on 23 out of 31 days in January. The severe weather this week is just a harbinger of worse to come, as new research from the University of Southampton and the Berlin-based think-tank Global Climate Forum predicts that coastal regions will face massive increases in damages from storm surge flooding during the 21st century. The study presents, for the first time, comprehensive global simulation results on future flood damages to buildings and infrastructure in coastal flood plains. The scientists warn that Asia and Africa may be particularly hard hit because of their rapidly growing coastal mega-cities, such as Shanghai, Manila and Lagos. According to the study published in the current issue of the “Proceedings of the National Academy of Sciences,” global average storm surge damages could increase from about $10-$40 billion per year today to up to $100,000 billion per year by the end of century, if no adaptation action is taken. In 2100, up to 600 million people – around five percent of the global population – could be hard hit by coastal flooding if no adaptation measures are put in place, the study shows. Substantial investments in coastal protection must occur in Europe as shown by the recent coastal floods in southwest England, says Professor Robert Nicholls from the University of Southampton, a co-author of the paper. With such protection measures, the projected damages could be cut to below $80 billion per year globally during the 21st century. The researchers found that an investment level of $10 to $70 billion per year could achieve that reduction. Adding to the challenge, international finance mechanisms have been sluggish in mobilizing funds for adapting to climate change, as the debate on adaptation funding at the recent United Nations climate conference in Warsaw once again confirmed. “If we do not reduce greenhouse gases swiftly and substantially, some regions will have to seriously consider relocating significant numbers of people in the longer run,” advises Hinkel. Regardless of how much sea-level rise climate change brings, the researchers say careful long-term strategic planning can ensure that development in high-risk flood zones is appropriately designed or avoided. The Environment Agency says work has already begun on an action plan to deliver robust defenses against floods in Somerset over the next 20 years.